I've been failing at my running for the past week. Between snow storms and sickness and Donald working late, I can't seem to get it done. On a more happy note! I asked Oscar how old he is going to be on his birthday and he said, "two"!!!!!! I was so shocked!! Grandma and Grandpa W will be here in 10 days!!! Happy Monday! I'm off to take advantage of this silence! #naptime. ....or maybe I should work on that shelf project I started....or fold laundry....I wish the coffee shop had delivery service. The neat thing is that she gets Spanish, music, gym, library, show and tell and reading buddy time!! I finally found a running program that I love. I'm not a runner and I'm nowhere near being an athlete. 6 weeks in and I've only missed one day. That was yesterday. I'm using the "Couch to 5K" app by fitness22ltd. It's awesome. It starts you off slow and easy doing short run/walk intervals. 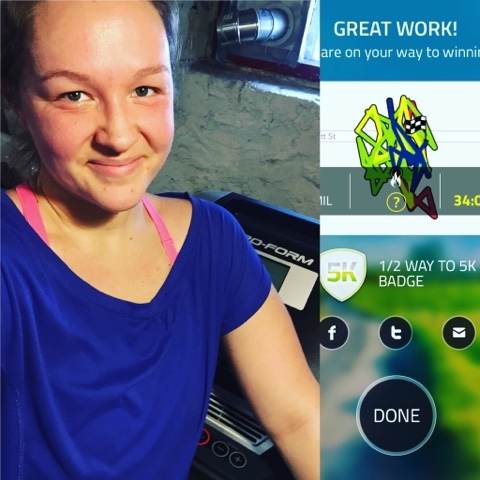 It's actually "doable" for someone like me:) Today's workout was two 10 minute run intervals with a 5 minute walk in between. There is always a 5 minute warm-up and cool-down. There was a glitch in today's workout and I hit a bit of wall so I decided I needed something to motivate! I signed up for my first 5K since 2008. Yay. Oscar is saying a few more words here and there....some are recognizable and some are, well...not so much. Whenever he cries he comes over to me and points to his eye and says, "eye", which means he wants me to wipe his tears away. He says, "on, lap (ap), done (un), Tap (Bap), see (eee), No, hi, bye"
He growls...a lot. And chases his sisters. He loves to be outside. His favorite things to do are shovel and eat snow. We're having trouble with his sleep again. He just won't go to bed. One night we put him back to bed at least 8 times. Not sure what the deal is. Sometimes he does it in the middle of the night too. Cars trucks and airplanes are his obsession. The other day, Jaina said, "Mom, did you know that sometimes alien's knees honk?" "I have magic in my brain." "Did you know that when I was a little baby I squished some ants and there was blood all over and then I ate the ants and they cut me open to get the ants out and but then they glued me back together?" This is how much Ava loves school. I asked her the other day if she would like to stay home for a day while her Grandma and Grandpa are here from Oregon or if she would rather go to school. She chose to go to school. Imagine that.